Everything you think you know about Groundhog Day is wrong. It’s not about predicting the weather or keeping up some quaint old world tradition–though both of those definitely do happen. 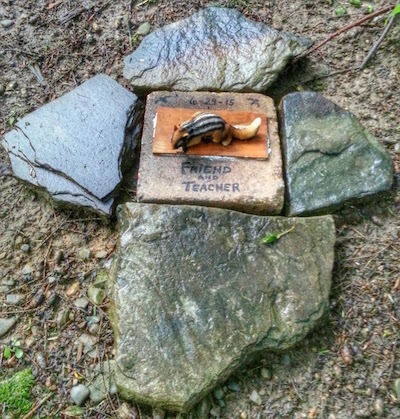 It’s not even really about the namesake woodland creature, but you can be excused for thinking so. If most of your information comes from the eponymous Bill Murray/Andie MacDowell movie, I’m afraid you’ve been even further deceived. 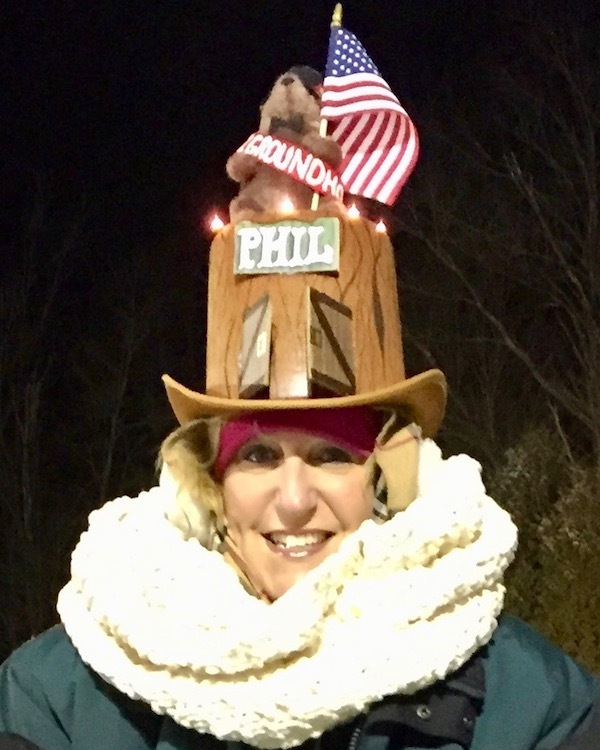 Who knew Punxsutawney Phil was a “Stripes” fan? 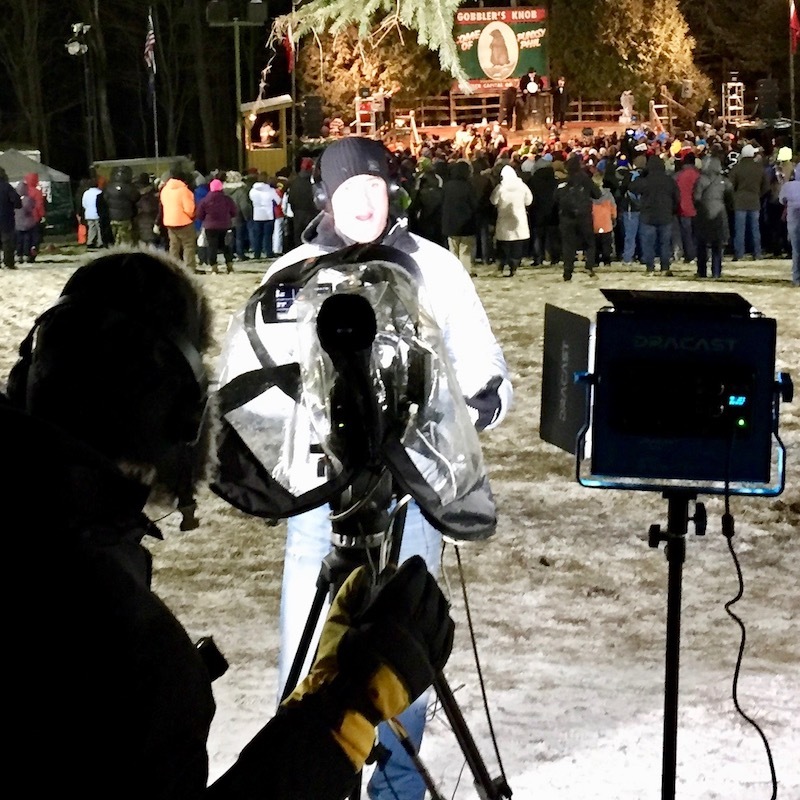 The Groundhog Day tradition goes back well over a hundred years–even longer if you consider its German roots–and is regular fodder for end-of-broadcast feel-good chuckles between hosts on the evening news. This much is all true. “This is my 11th year!” Super fan from Youngstown, Ohio. Of the many things Groundhog Day, Harold Ramis’ 1993 feel-good fantasy/comedy, gets wrong is that Bill Murray’s cynical weatherman Phil Connors can’t just roll out of bed at 6:00 AM, chit-chat with Ned Ryerson, and amble across the town square to file his report. No no no. First of all, you can bet the local network affiliate isn’t ponying up for surge-priced B&B rates on the single day when every lodging in greater Punxsutawney has been sold out for a year. When our crew arrived at 2:00 AM, there was an imposing fleet of satellite-equipped TV trucks already camped-out in the parking lot. All the major networks were there, along with a handful of cable new outlets, plus The Weather Channel and AccuWeather. Big engines were humming and news crews had clearly napped–as best they could–right there in their bucket seats and were already mainlining black coffee to get through the long morning. Phil Connors never got up this early. News crew “doing it live” around 4 AM. 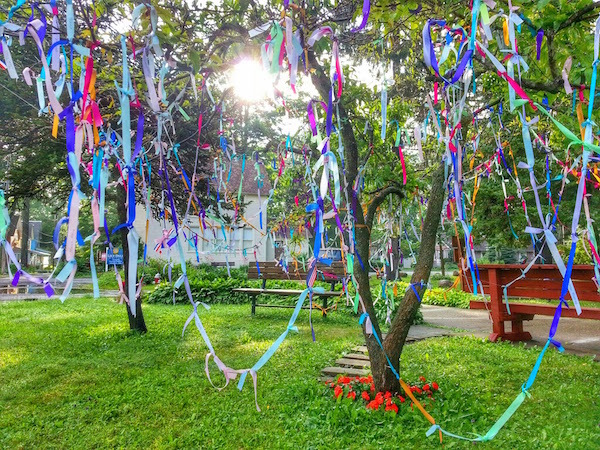 More importantly, though, the movie–filmed not in Western Pennsylvania, but in Woodstock, Ill.–makes it out as if the event takes place in the center of town, on a square surrounded by local businesses. There, a couple hundred people gather to watch Phil do his thing in the broad daylight. 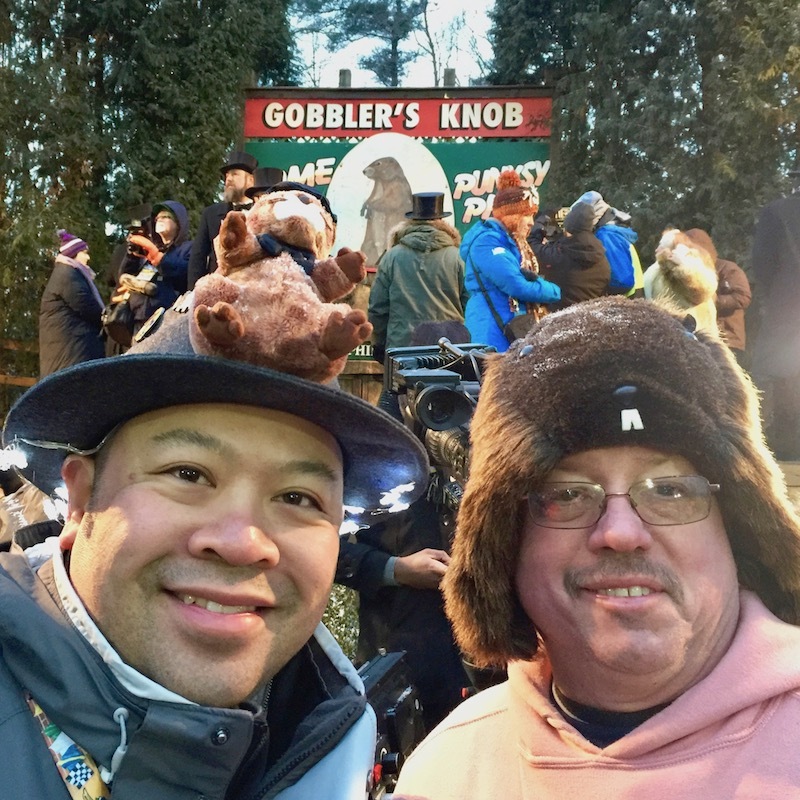 The real Gobbler’s Knob is around a mile–as the crow flies–from Punxsutawney’s equally-charming, but differently-shaped downtown. It sits in the basin of a wooded area–sort of a natural amphitheater–with a large stage and some unobstructive railing to keep the crowds from pushing in too close when things get crazy. There is not nearly enough parking to accommodate the mass of Phil faithful, so participants arrive through the night and into the early morning on one of a non-stop series of school buses literally moonlighting as town-to-Knob shuttles. The hardier and/or more impatient hoof it up a curling back road from the east side of Punxsy. Groundhog Day has become a massive draw for little Punxsutawney. The town of around 6,000 attracts way more visitors than that number to the event. Varying estimates put recent crowd sizes between twelve and thirty thousand people. 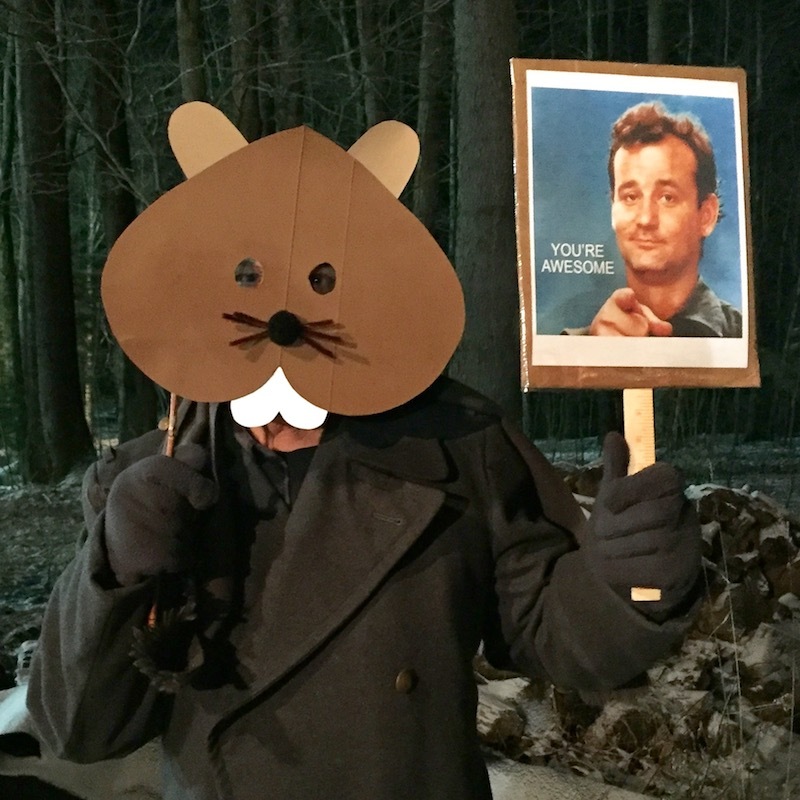 Groundhog Day may be the world’s coldest, darkest D.I.Y. fashion event. 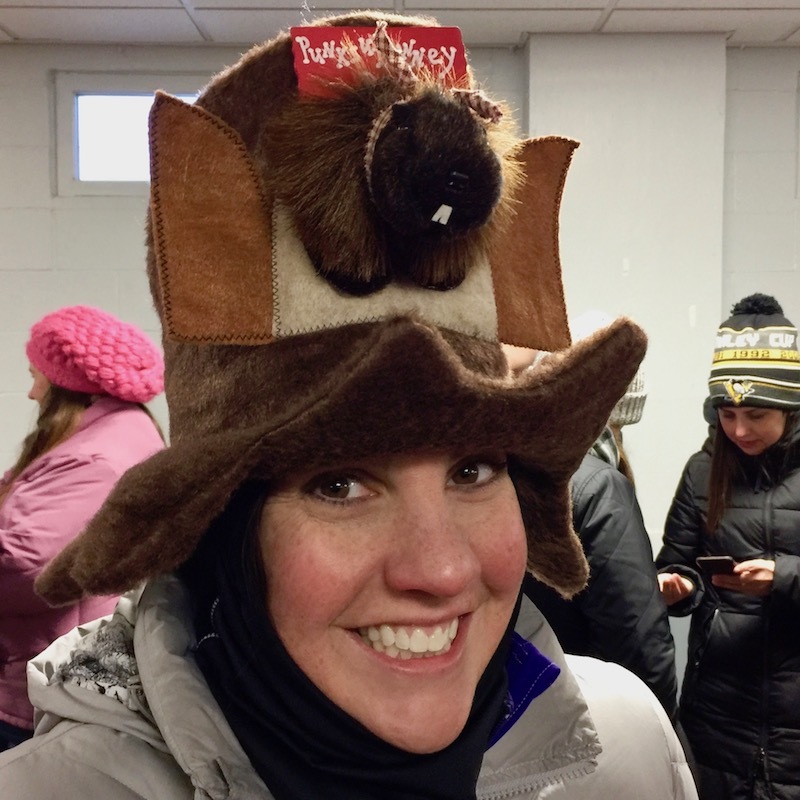 This first-time visitor had no idea that so much of the audience would arrive in various degrees of groundhog attire and tribute. 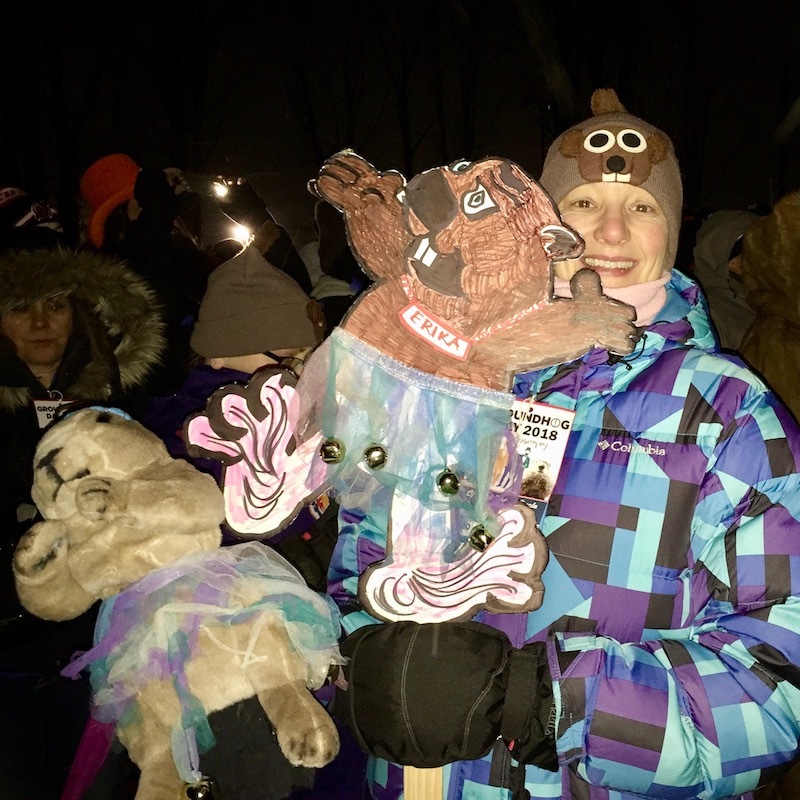 There were groundhog masks and groundhog puppets, groundhog t-shirts and super-fan signage, stuffed groundhogs, and full-body groundhog suits. Who’s Erika? Lady groundhogs with colorful skirts. But it is the hats that really mark this festival. Custom-made toppers of all designs–stacked hog heads like faces on a totem pole and dainty scenes of Phil frolicking in a bed of feathers, pearls, and wispy notions. 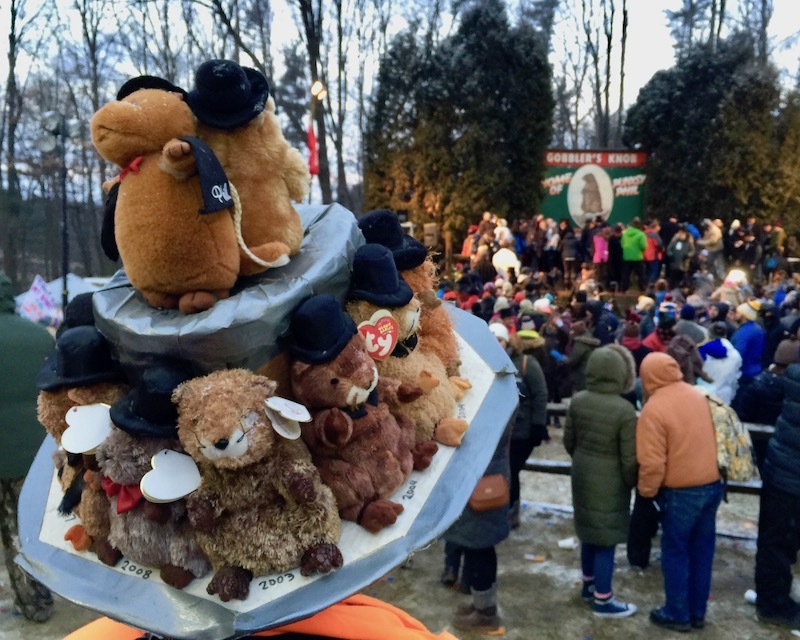 There are countless renditions of The Punxsutawney Prognosticator either emerging-from or sitting atop his stump and all manner of knit caps featuring cartoonish eyeballs, buck teeth, and little ears. How many of these are fan-created vs. purchased in downtown Punxsutawney’s groundhog gift shops we do not know (yet!) 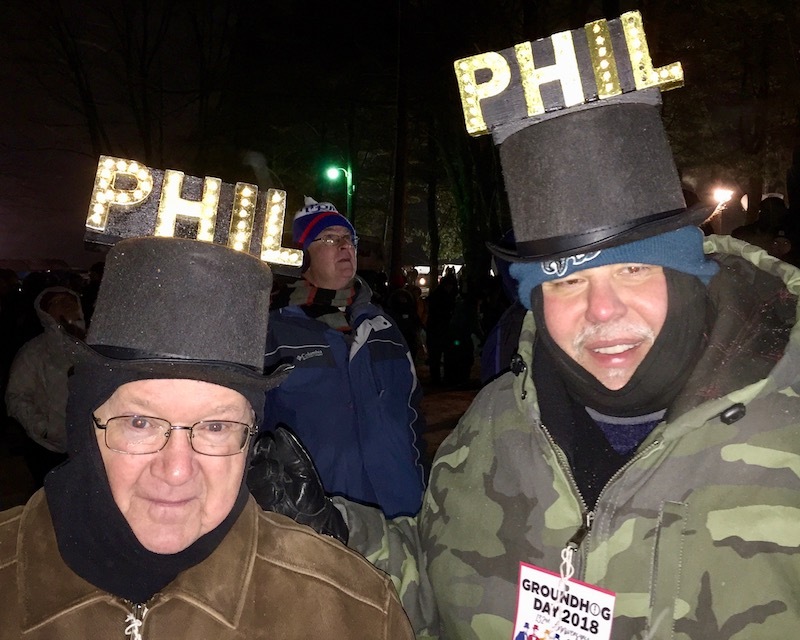 but any way you slice it, the sheer breadth of Phil-themed headwear was incredible. Orbit staff did its best to get around and document what we could, but please realize the photos included here are but a tiny proportion of the actual outfits. 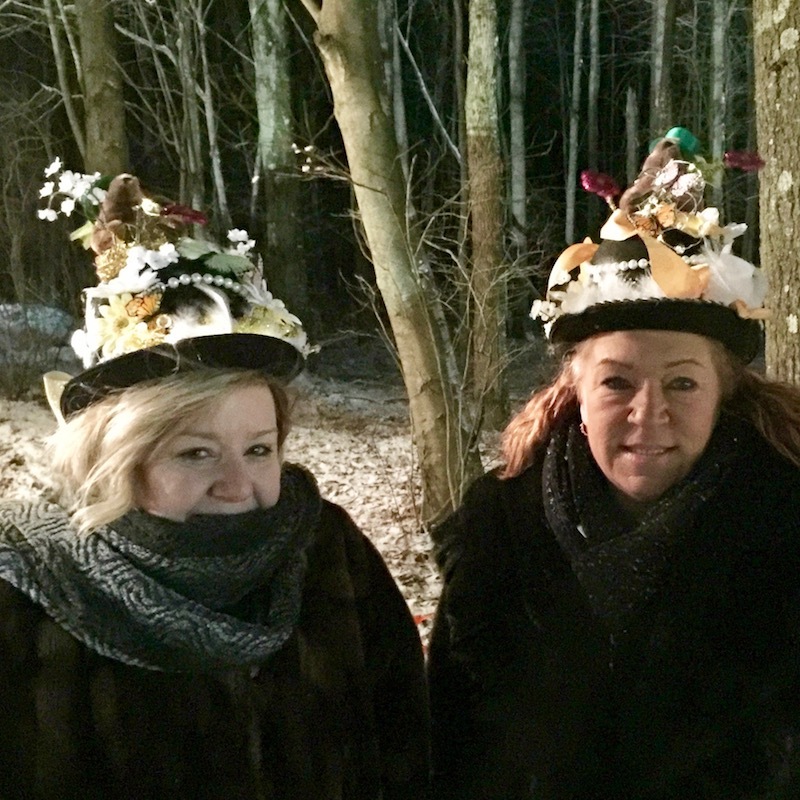 “We go everywhere in costume.” Friends and first-time attendees from Virginia with made-for-the-occasion hats. Ain’t that America. Patriotic Phil and stump hat. Fans from Ft. Lauderdale and Chicago. 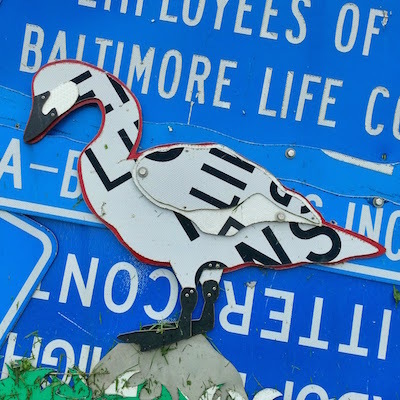 Signs o’ the times. Young fans. 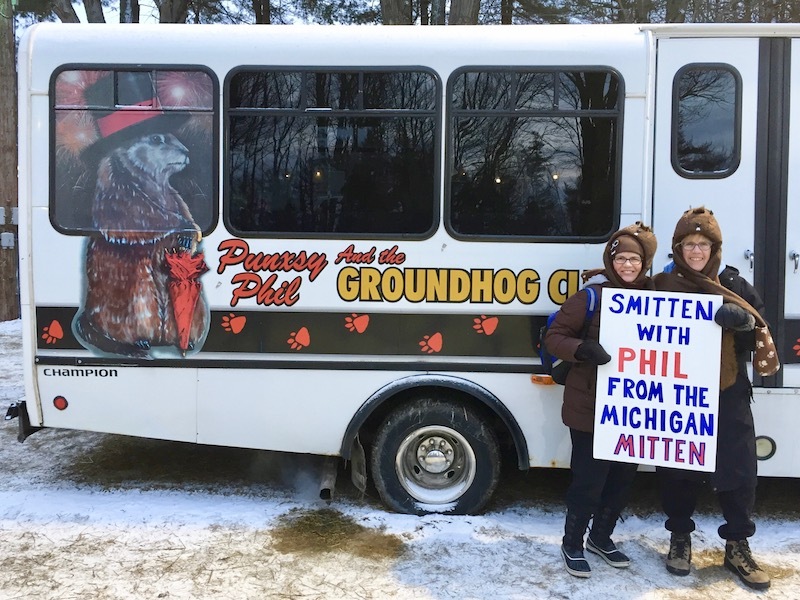 Sister-fans from Michigan in front of the Groundhog Club’s Philmobile. 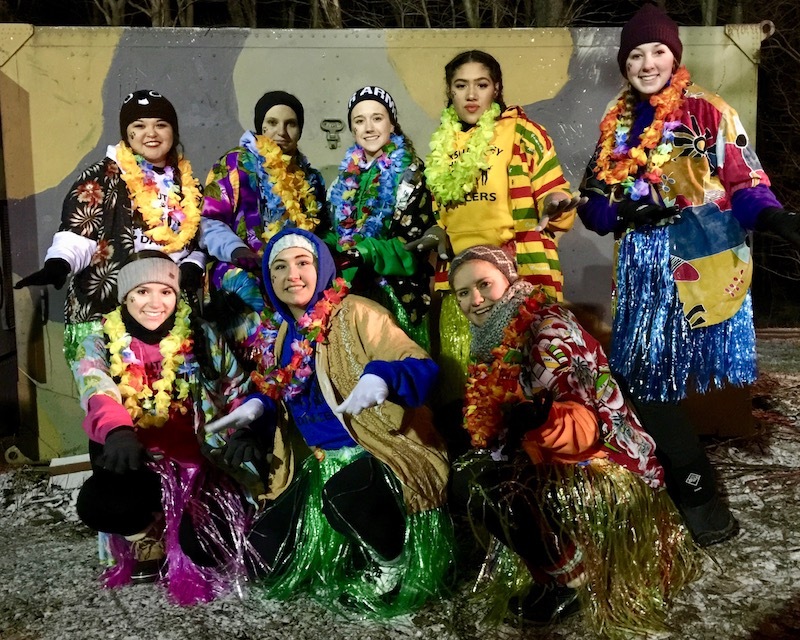 The Phil-ettes Dancers before their 5 AM hula routine. … and then there’s daybreak. My goodness, you’ve never experienced the glory of a sunrise until you’ve spent an entire evening in 12-degree blackness. It was as if natural light did not exist. The feeling of the first rays of a new dawn filtering through spindly tree trunks of a snowy, Jefferson County wood are to be born again, to be showered in light, to feel the absolute glory of being alive. It is at this precise moment–the event is tightly coordinated to apex at daybreak–that The Inner Circle makes its solemn approach. Twelve (fifteen, maybe?) men [yes: they are all (white) men] in black top hats, long coats, pants, and dress shoes take the stage and perform a variation on the same Groundhog Day ritual that goes all the way back to 1887. Members of The Inner Circle make their approach at daybreak. That makes the whole thing sound overly serious–it’s not. There’s a little razzle-dazzle, some corny jokes, and a bunch of good-natured playing-to-the-crowd shenanigans. Phil proceeds to tell us all our future–at least the next six weeks’ worth–relayed through an Inner Circle member who “speaks Groundhogese” with the aid of a weathered walking cane allegedly passed-down from generations of previous Inner Circle insiders. This is important: it is completely unclear where the whole “sees his shadow” bit comes from. Phil was presented not with options toward and away-from the low-angle morning sunlight, but instead with two tiny scrolls, unfurled, read aloud for the audience, and laid out before his discriminating paws. It turns out the groundhog is not some freaked-out wimp, scared of his own shadow, but instead one who appreciates the winter as a good time to catch up on his reading and make a thoughtful decision. The uninitiated cynic–especially one from a warmer, more sun rich environ–might imagine Groundhog Day as a group of shivering bumpkins, inanely praying for a rodent’s divination to the end of their long, cold suffering. Move to Florida! they smugly think to themselves, resting their sunglasses to tend the hibachi. But that shallow reading misses everything. No, the holiday is not a prayer for sunshine; rather, it’s a defiance of winter. 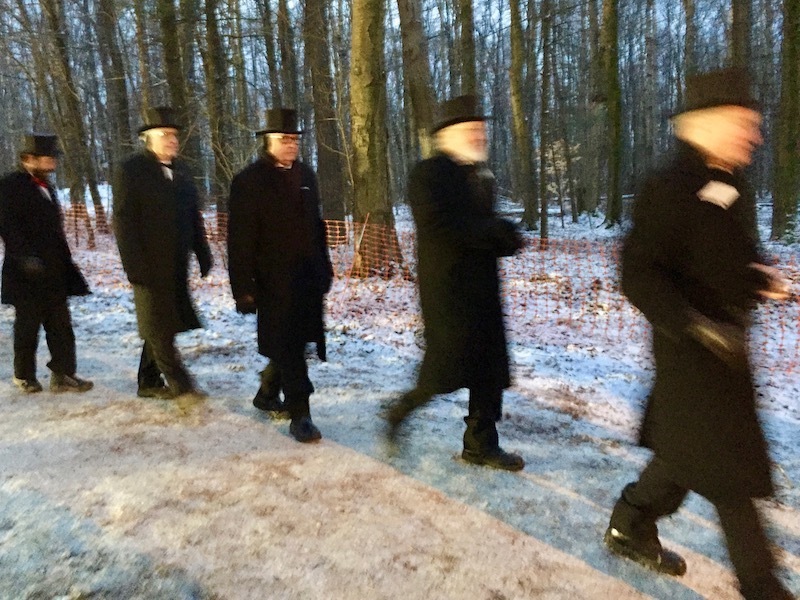 Participants don’t just go out in the cold for fun–as skiers or Christmas shoppers might–but rise in the middle of the night, staying out through the longest, darkest, and coldest hours of the year in total communion with the groundhog. 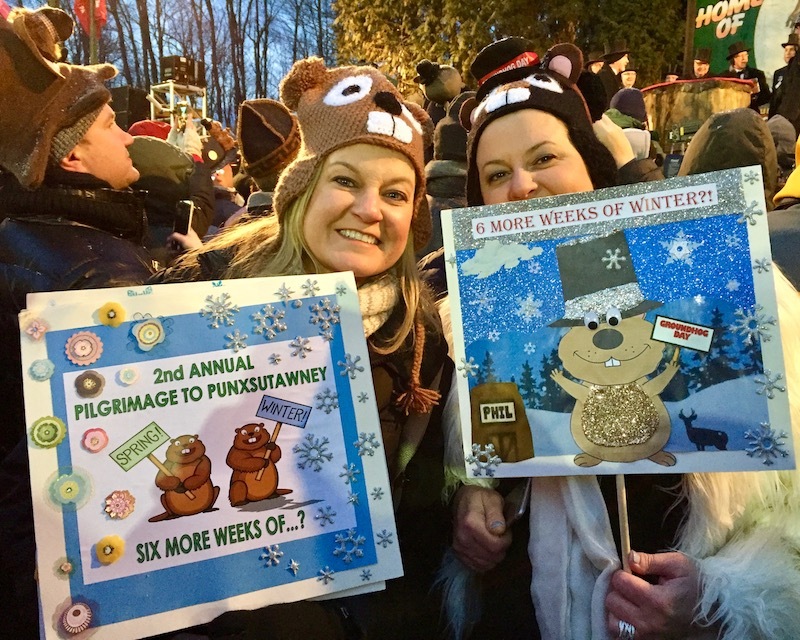 It’s flaunting woodchuck fashion with signs asking for–nay, demanding—more winter! The roar of applause that greets the news of six more weeks of the cold stuff is a hardy people’s collective nose-thumbing (note: not middle finger–this event is as wholesome as they get!) at the notion that fun is inextricably bound to sun. It is not. 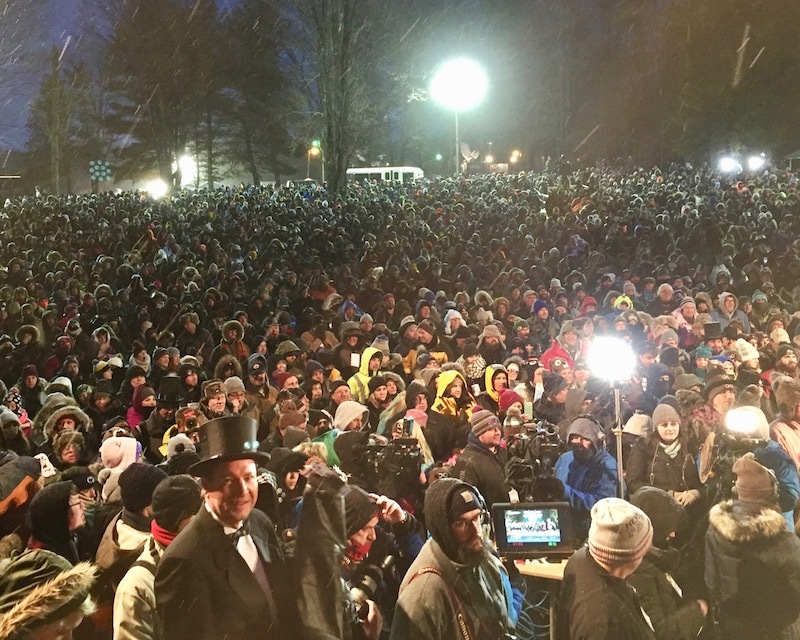 The clean-cut, hopped-up, groundhog-crazy crowd at Punxsutawney proves exactly that. To Ol’ Man Winter–just like Phil, George W. Bush, and that fleet of Hollywood cheerleaders before us, we say, bring it on. Getting there: Punxsutawney is about an hour and a half drive northeast of Pittsburgh. The gates to Gobbler’s Knob open to the public at 3 AM on Groundhog Day, February 2 of each year. In 2019, this will conveniently fall on a weekend–just sayin’. 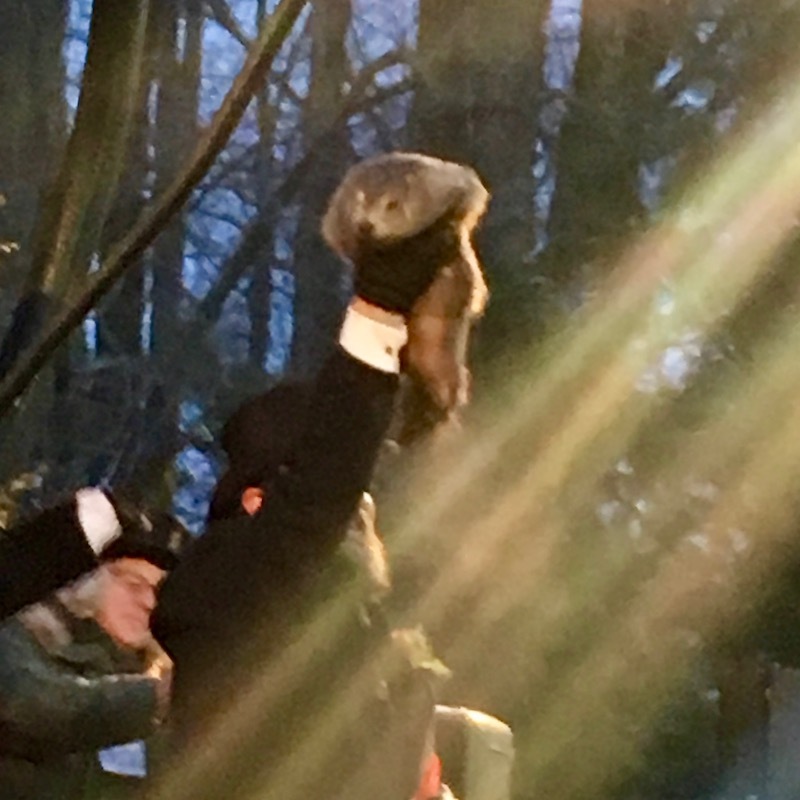 The legend goes that there is only one Punxsutawney Phil, a groundhog imbued with everlasting life–but this is a subject way to broad to cover in this post. 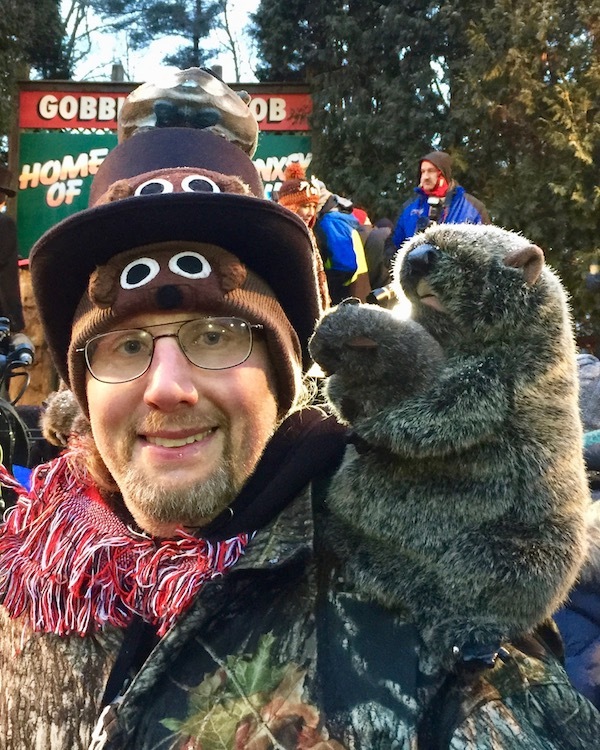 For the record, this blogger still thinks Groundhog Day is a terrific movie–it’s just not factually accurate to the experience in Punxsutawney. 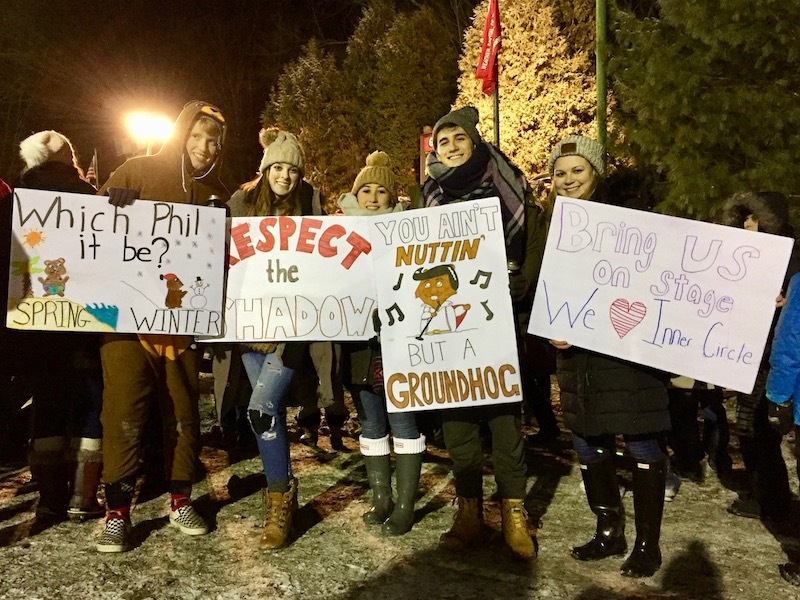 In fairness, the high attendance at Groundhog Day (the event) over the last 25 years is largely attributed to the lasting popularity of the movie. Crowd sizes in 1993 (and earlier) were likely much smaller than today. No thanks to our cub reporter staff! Thirteen other people in The Orbit‘s posse and not a one turned in a hat photo. Don’t come looking for recommendation letters, you slackers! 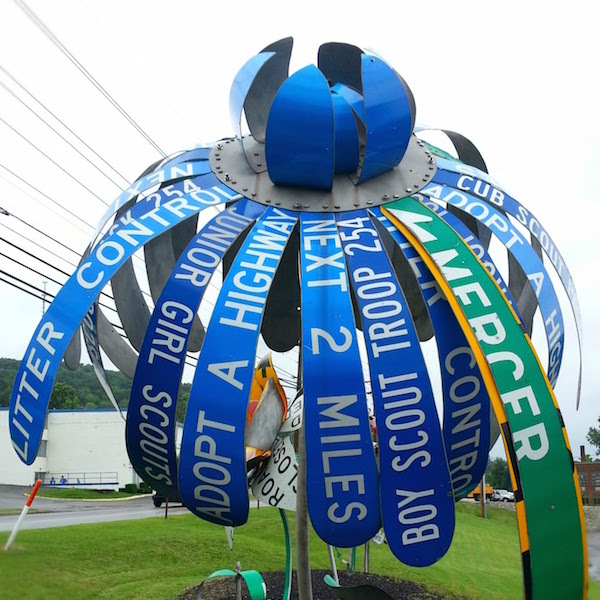 Back in July, we ran a piece on the PennDOT road sign sculptures in Meadville, just up the highway from Pittsburgh. 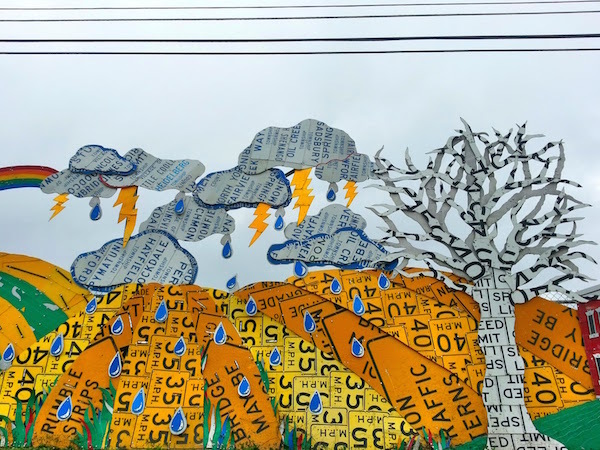 That post detailed the quarter-mile-long fence/mural that stretches down Route 322 and forms the majority of the immense sculptural project on the property of the local highway maintenance yard. But not all of it. 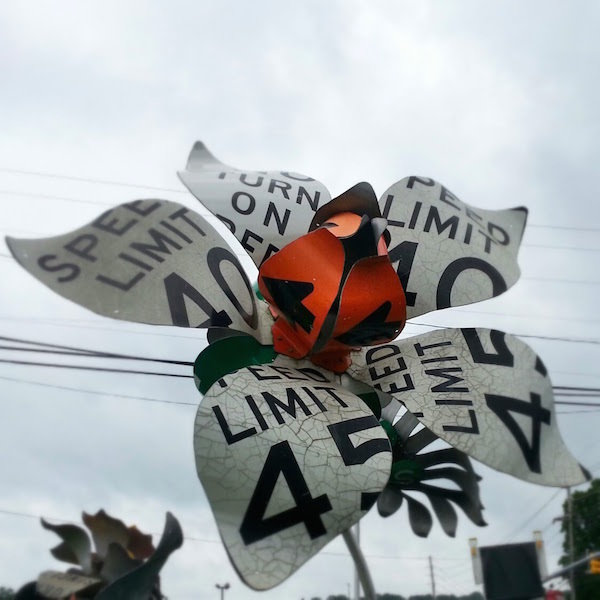 There is so much art in the PennDOT project that we decided to break the story in two parts, with this second post dedicated to the gorgeous flower garden that sits at the corner of Rt. 322 and Mercer Pike/Rt. 102. It’s interesting that with all its financial backing and oversight, the brand new Whitney Museum was not sited at a location with Sheetz and Dairy Queen franchises on opposing corners. Worry not: no such oversight was committed in Meadville. Why, if the Crawford County art connoisseur and gastronomist wanted both an order of Sheetz’ Pretzel Meltz or Shnack Wrapz paired with a DQ Peanut Butter Cookie Dough Smash Blizzard Treat, well, she’d be all set, wouldn’t she? And what if her old man had a hankering for one of Sheetz Cold Subz or Saladz, washed down with an original Orange Julius? You know he could find that too–hopefully with room for a Peanut Buster Parfait. In their present form the flowers look like the work of some combination between Dr. Seuss and Dr. Jekyll. 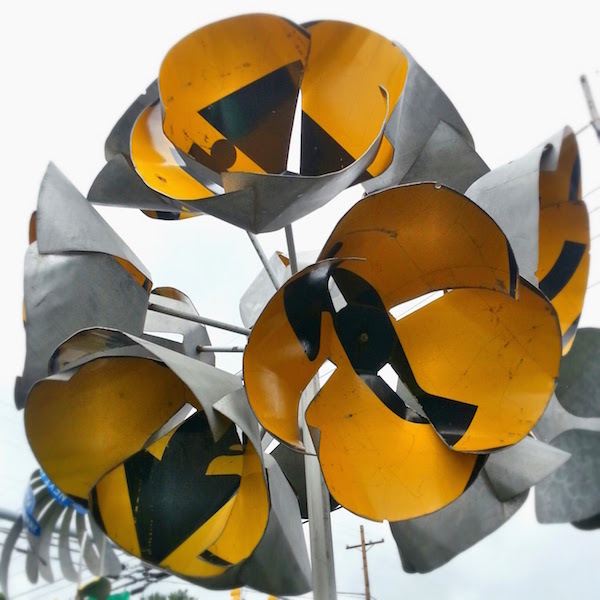 All fantasy shapes and riveted steel; eye-popping iridescent reflectors and crudely cut welded metal. These photos may or may not accurately represent the scale of these pieces, so let’s just say this tall blogger was dwarfed by even the shortest of the flowers which easily topped-out at ceiling height. 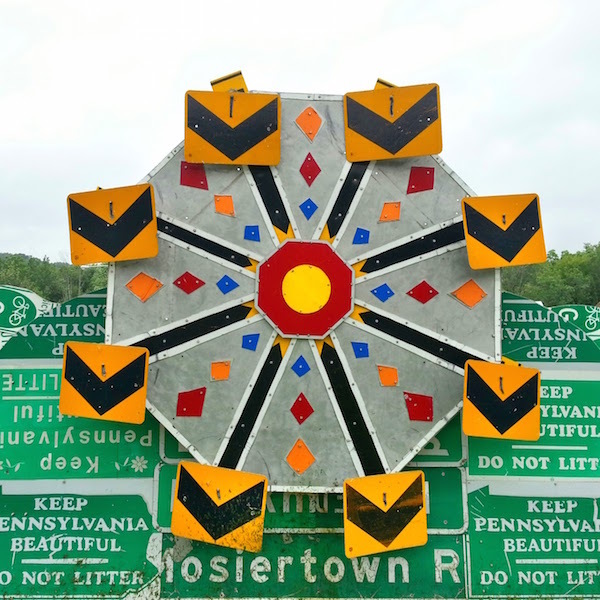 Trying to figure out which particular specimins the sculptures may represent–or even if they’re modeled on reality–led this blogger down the rabbit hole of Pennsylvania flower identification. Where’s cub reporter Tim when you need him? I won’t claim we came away with any clear IDs, but we’ve got our suspicions. We’re pretty sure we located sweet wakerobin (Trillium vaseyi) in the garden, [note to self: consider “Sweet Wakerobin” for next band name] maybe a sunflower, but, we realized pretty quick that trying to match bent steel that reads Boy Scout Troup 254 to a nature guide is a fool’s errand. 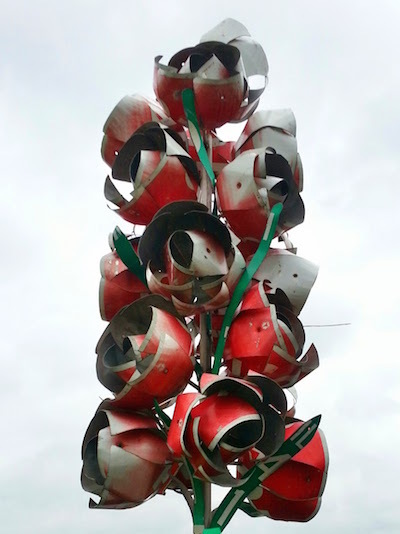 Maybe we could put some real scouts to work, you know, scouting actual local flora against these art flowers. Or maybe we should just sit back back with our M.T.O. Chicken Stripz and enjoy the scenery. 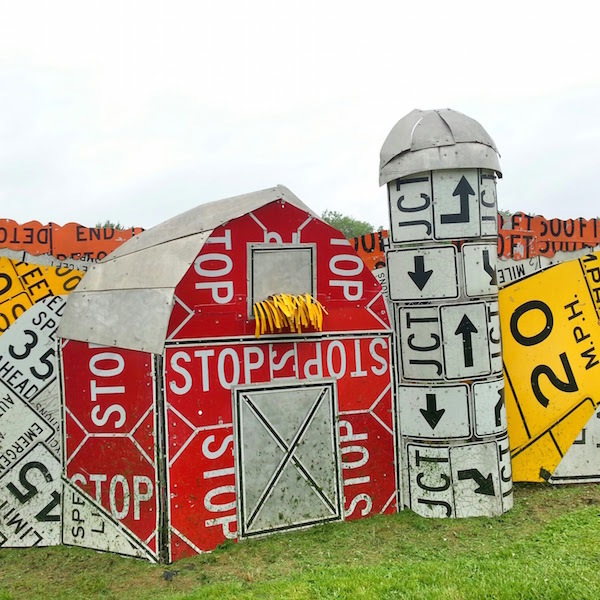 Like the best art, the Meadville PennDOT sculptures are equal parts wonder and inspiration. How did they do that? at the same time as I want to do that! And I truly would love to do that. Maybe all it would take is a pair of tin snips, a couple trips to Construction Junction, and box of Band-Aids. Oh, and that pesky basement cleanout. It was a dreary, cool, rainy day when The Orbit crew pulled off the highway for some high art and a bag of Combos. We’d describe the weather as very un-summer-like, except it was very much in keeping with this particular summer. This cool-weather-lover is certainly not complaining–give him forty-five degrees and drizzling and you’ll find one happy blogger chortling to himself as he types. 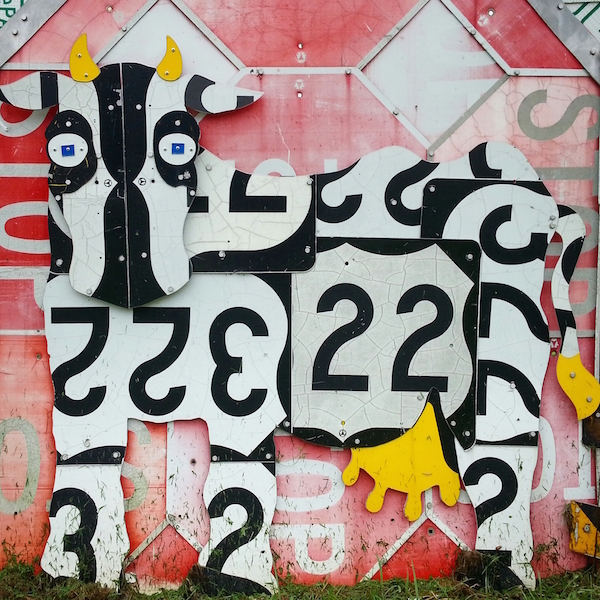 That said, we were hoping for a break in the rain long enough to photograph one particular roadside curiosity, and were granted that particular wish. An hour-and-a-half due north of Pittsburgh lies Meadville, the seat of Crawford County. 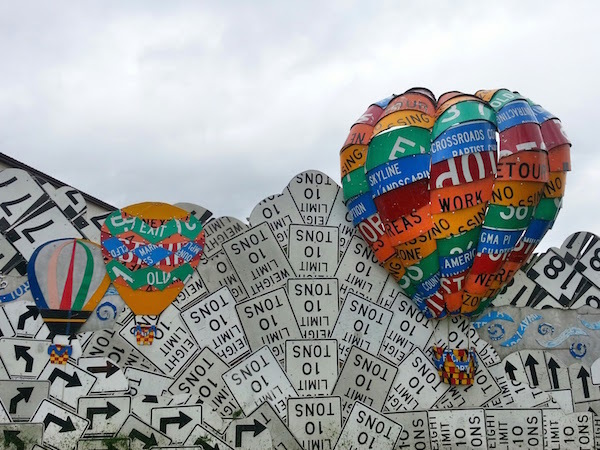 This smallish town is the unlikely host of an immense collection of sculptures, all in connection with and displayed by the local Pennsylvania Department of Transportation (“PennDOT”) maintenance yard. 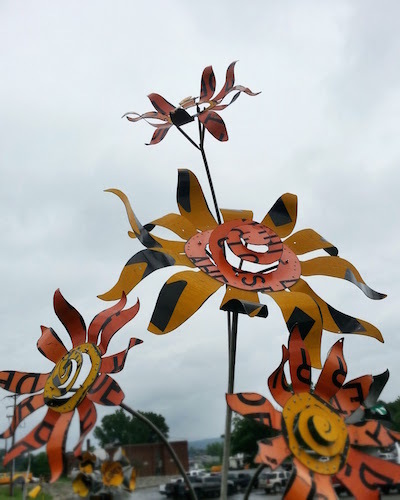 According to PennDOT, the fence/mural project and its adjunct flower garden (more about that, later) were conceived by Allegheny College art professor Amara Geffen and Jack Molke, former Crawford County maintenance manager. 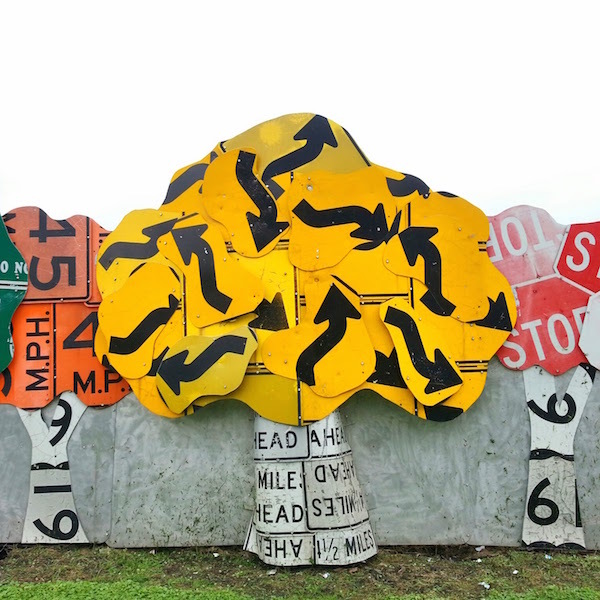 The actual work was executed both by Allegheny College art students and the local PennDOT workers. 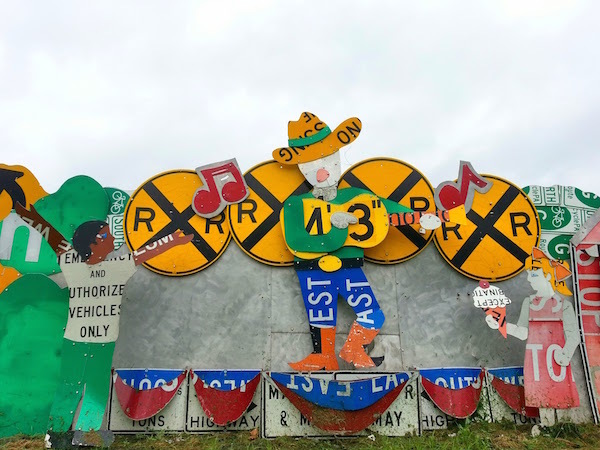 It began back in 2001, but continued over many years until the entire maintenance yard fence was covered. 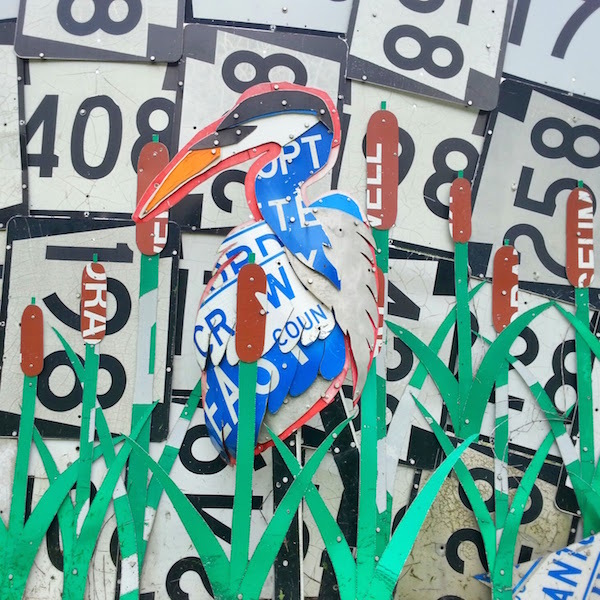 The mural depicts life in Crawford County highlighting annual events such as the Thurston Balloon Classic and the Crawford County Fair. Local community landmarks such as the Crawford County Courthouse, Conneaut Lake Park, and Allegheny College’s Bentley Hall highlight the scene. The project depicts life in Crawford County with farm scenes, seasonal scenes and downtown Meadville buildings. What no set of photographs will accurately depict is the sheer immensity of this piece. The fence is well over human height and probably reaches up to ten or twelve feet. It stretches some 1,200 feet (approx. a quarter mile) down Route 322 and around the corner. The fence is at once a single continuous piece and also dozens of distinct interlocking sections that each bleed into one another. There are broad strokes like rolling Crawford County hillsides and a series of sections devoted to (downtown Meadville?) storefronts. 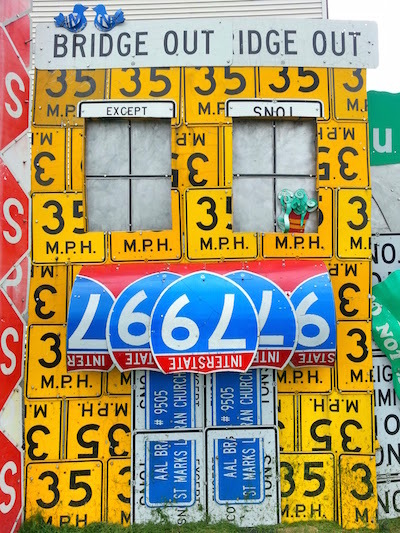 But the detail on the pieces is terrific with little touches that play with the recycled signage and “Easter egg” details that you’d never catch if you just did a drive-by. For all these reasons, it’s really worth parking and taking a walk down the full length of the fence and back. Then, like all great art experiences, you can cross the highway to Sheetz for some M.T.O. and group reflection. 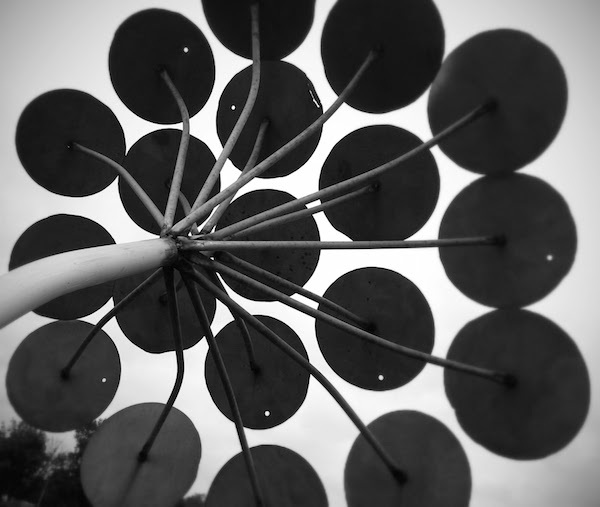 Are the sculptures worth a trip from Pittsburgh? They’re pretty great, and no set of photographs is really going to do them justice, so we’d have to say yes. That said, combine them with the next time you’re heading to Erie, or Conneaut Lake, or are just making a run to Meadville’s own Voodoo Brewery and you’ll have yourself a fine combo for your Combos. Far Western New York is certainly outside of what can be reasonably considered “the Pittsburgh region,” but at two hours and change driving time (each way), it’s a doable up-and-back, so we’re going to include this one as An Orbit Day Trip. 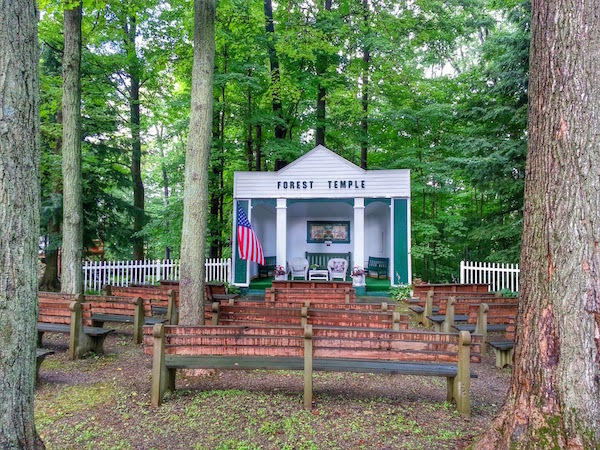 Lily Dale (aka Lily Dale Assembly), New York is a picturesque Victorian village that sits on tiny Lake Cassadaga, between Fredonia, Jamestown, and Chautauqua. It bills itself as “the world’s largest center for the science, philosophy, and religion of spiritualization.” While this chakra-curious blogger would be hard pressed to name a larger center for such things, at just a handful of streets, maybe a couple hundred year-round residents, it’s still a little difficult to believe Lily Dale is the largest anything. But we’ll take their word for it. That said, the ratio of psychics-to-ne’er-do-wells is extremely high. Seemingly every other one of Lily Dale’s cottage-houses has a shingle out advertising the services of one or more registered in-house mediums (media?). Lily Dale is also home to the National Spiritualist Association of Churches (NSAC). 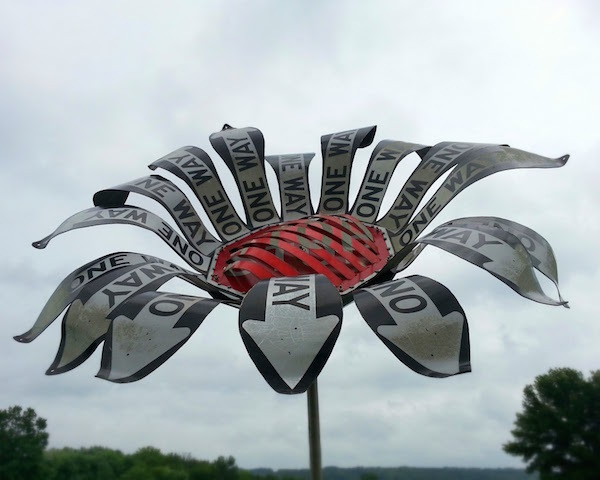 The catalog for the June-September workshop programs is ample and either the lecturing-on or attending-of these courses, along with individual “readings” with the aforementioned mediums, seems to be what people do in Lily Dale. Instructors Michele Whitedove, Lee Two Hawks, Shadow Fox, and others with less spectacular names offer courses on subjects like Banshees, Curses, and Little People; Interdimensional Out-of-Body Travel; Orb Phenom–Orbs Are Among Us; Etheric Projection & The Human Energy Field; The Art of Using Pendulums, Dowsing Rods, Sticks & Stones; and Spoon Bending. While The Orbit generally subscribes to a “when in Rome…” philosophy, we’re also too skeptical (and too cheap) to pay $45 (the going rate for a two-hour workshop) to get our Laugh-a-Yoga Leader Certification. 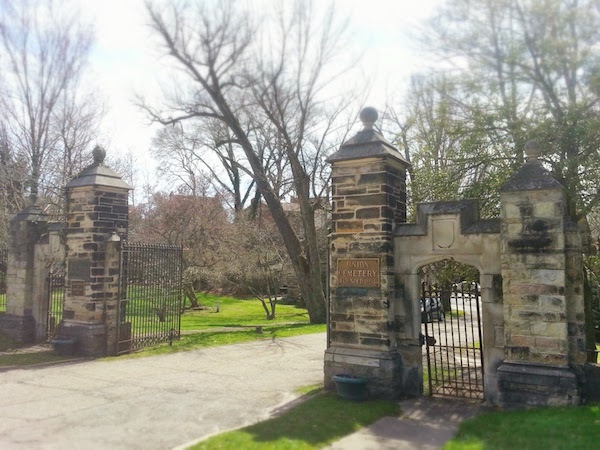 Whether all this New Age stuff strikes your divining rod or seems like a bunch of hooey, Lily Dale is absolutely a lovely and magical little place to visit. The whole landscape is completely enmeshed in tall woods and seems bathed in the gauzy soft light of an Elfin dreamland. 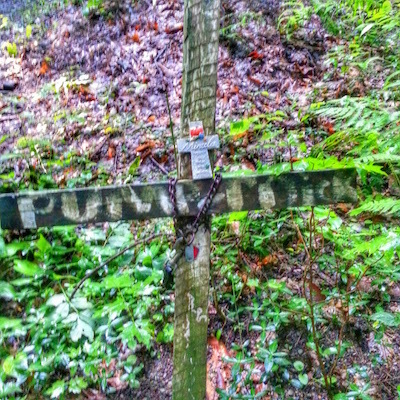 We skipped the lectures and stuck to nice walks of the town, lakefront, Forest Temple, Inspiration Stump, Fairy Trail, and pet cemetery–all recommended. 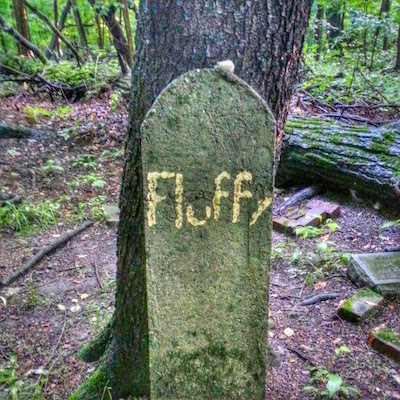 This was The Orbit‘s first trip to a legit pet cemetery, but hopefully not our last–we’re hooked! Lily Dale’s goes way back. The earliest dated stone we saw was from 1920, but I got the sense it was considerably older than that. 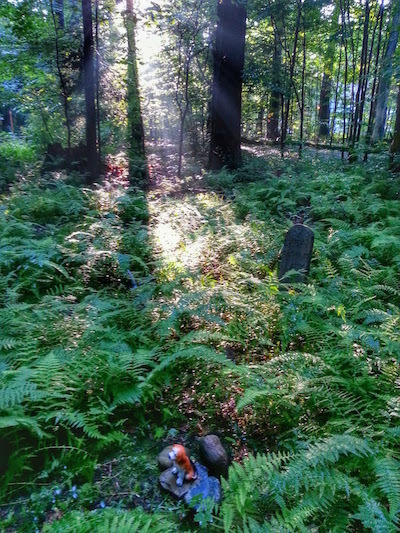 There are hundreds of graves in the small forest clearing where the cemetery stands. 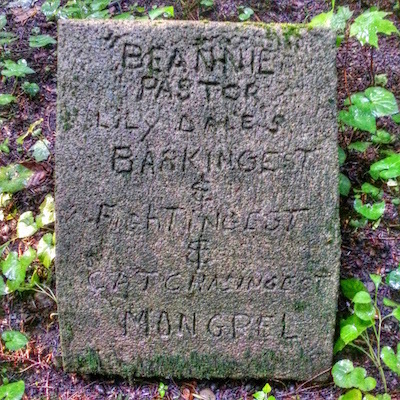 The markers range from professional chiseled stones with names, dates, and epitaphs, to crumbling homemade crosses, sculptures, cast concrete, and painted rocks. Getting there: As mentioned, it’s somewhere around two-and-a-half hours drive from Pittsburgh to Lily Dale. Likely a lot faster if you can travel interdimensionally out-of-body, but we’re old-fashioned. There are numerous inns, beds and breakfast, and one old hotel on the grounds. But really, if you’re not attending the seminars, you can probably see everything you need in a few hours–it’s just not that big. There are two non-fancy/grab-and-go restaurants, one coffee shop, and one general store in the town. Also be warned that there is a steep ($12 per person per day) gate fee to get on the grounds. My advice to the casual visitor would be to park somewhere outside the gate and see if they’ll let you walk in for free. Onion Dome Fever: Holy Transfiguration! 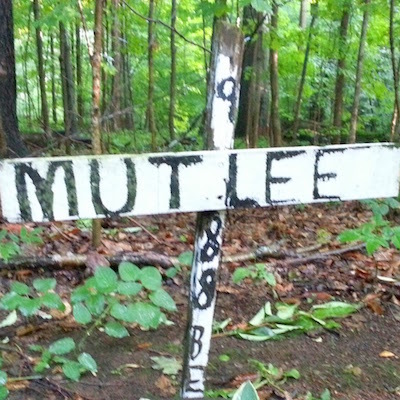 The Orbit road crew was a on a mission to find the grave of Jimmy The Greek in Steubenville, Ohio, and find it we did. Oh yes, find it we did. 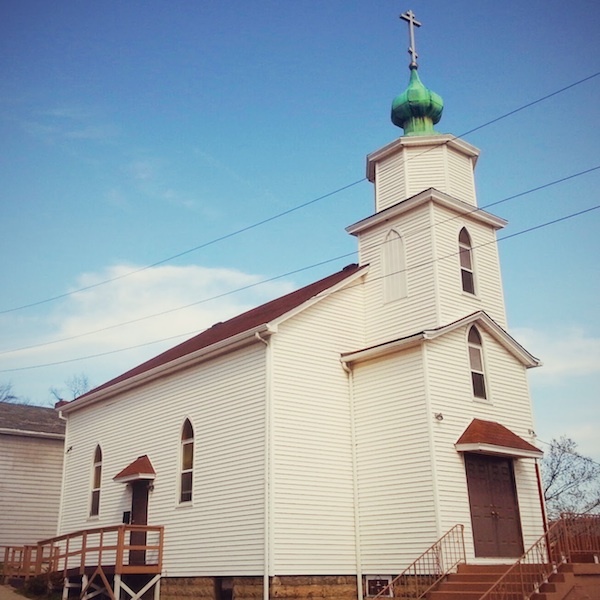 But as we were heading up Washington Street from downtown, there, sparkling like a new penny, was the phosphorescent green mini onion dome of Holy Transfiguration Russian Orthodox Church. Never ones to avoid getting distracted by shiny things, we detoured up to the tiny dead end of North 10th Street to get a shot of the church all lit up in the afternoon sun. Pastor Greg, dressed appropriately in a friar’s dark, knotted robe and sandals, spotted me taking pictures outside and asked if we’d like to come in for the service that was beginning in fifteen minutes. We politely declined, to which he followed up by urging us to just come inside for a look. That was an offer we couldn’t refuse. 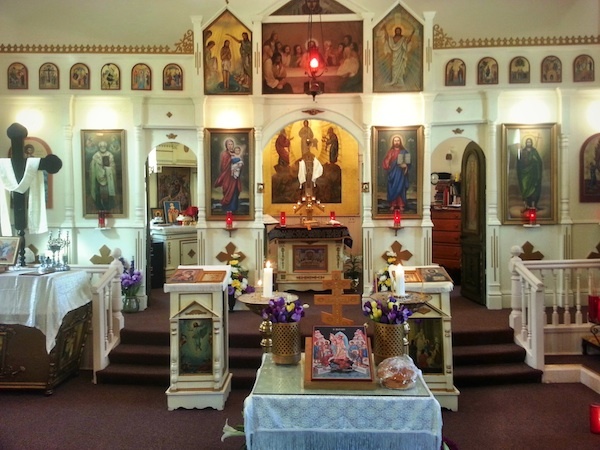 The humble country church look of the outside didn’t give any clue to the gorgeous collection of gold leaf icons, burning candles, Byzantine crosses, live flowers, incense burners, brassware, lace cloth, and the like that awaited within. The pastor had departed in his minivan to pick up a parishioner who needed a ride to the service. I wish we’d had the chance to ask him about the history of the church and the current state of the laity. That very congregation was beginning to file in as we were poking around, so it started to feel pretty awkward and we made our exit. Steubenville has been draining population since the 1940s (The Greek led that wave out of town), and my guess is that the number of Russian Orthodox parishioners is dwindling in the low double-digits. 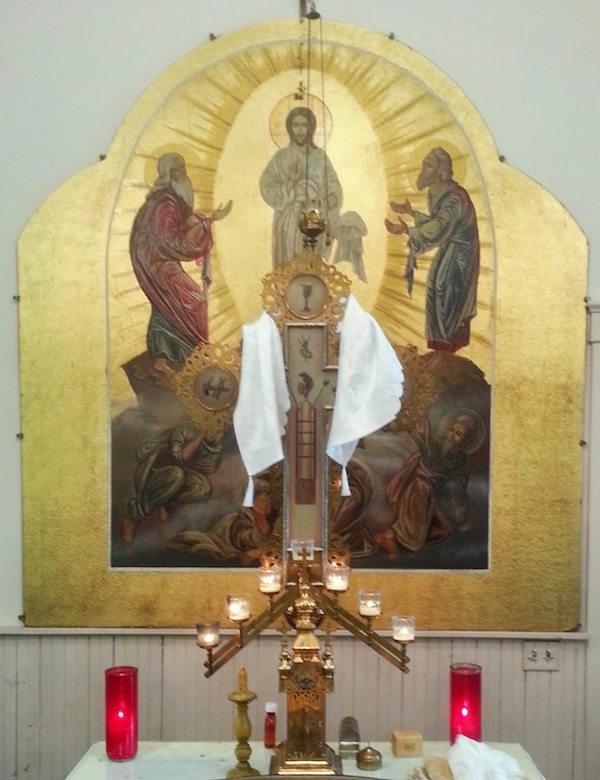 So one hopes that Holy Transfiguration will be around for Steubenville’s inevitable glorious comeback, but it will probably take a little divine intervention. 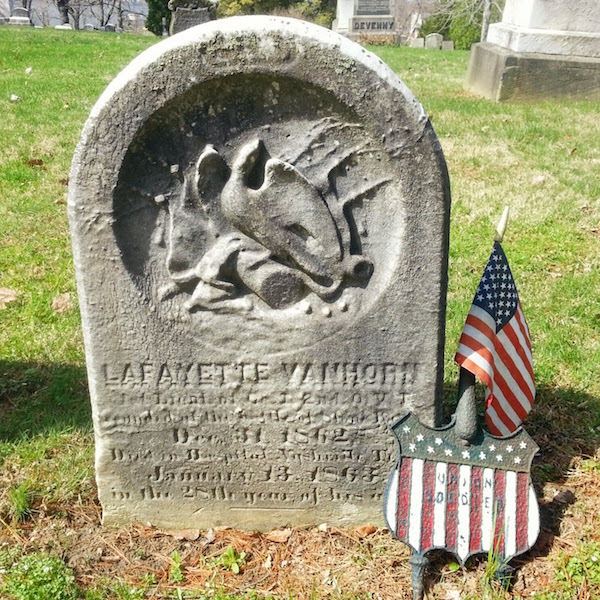 SPOILER ALERT: There is no head stone to visit, no special directional signage like the “1812 Veteran” or the “Fighting McCooks” or the “Grandparents of Woodrow Wilson” get, and there’s not even a place to leave a tributary poker chip or tip sheet from the nearby Wheeling dog track. No, when you actually arrive at the final resting place for Jimmy “The Greek” Snyder, it’s on the very top row, well above even this tall blogger’s head height, inside a sterile mausoleum called the New Chapel, marked with a simple brass nameplate that’s barely legible standing on the floor in full daylight. The photo I took inside was so uninteresting I decided we’d just go with the exterior shot. 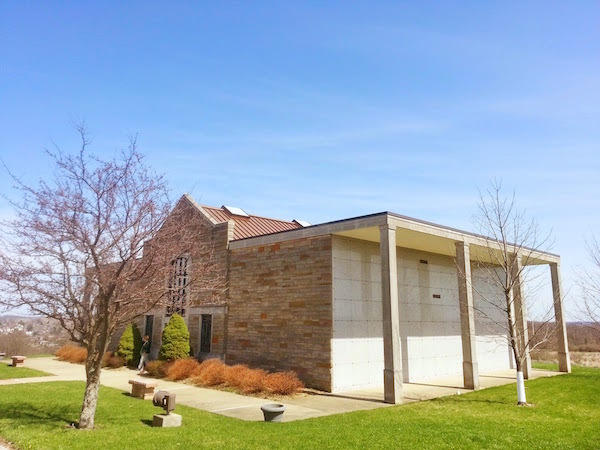 The Greek died of some combination of diabetes and coronary failure in 1996, the year after New Chapel was built at Union Cemetery in Steubenville, Ohio–Jimmy’s home town and an easy jaunt from Pittsburgh. Jimmy’s loved ones may have thought that having the latest and greatest in resting places for the family was practical (his sister Marika Berris died in 2009 and is entombed right next to Jimmy), but I’d guess that he was secluded high out of sight, out of mind, and–perhaps, most advantageously–out of reach from any malice that may have been directed his way in the afterlife. Jimmy The Greek’s rise and (epic) fall is legend to a generation that was paying attention to such things in the 1980s. 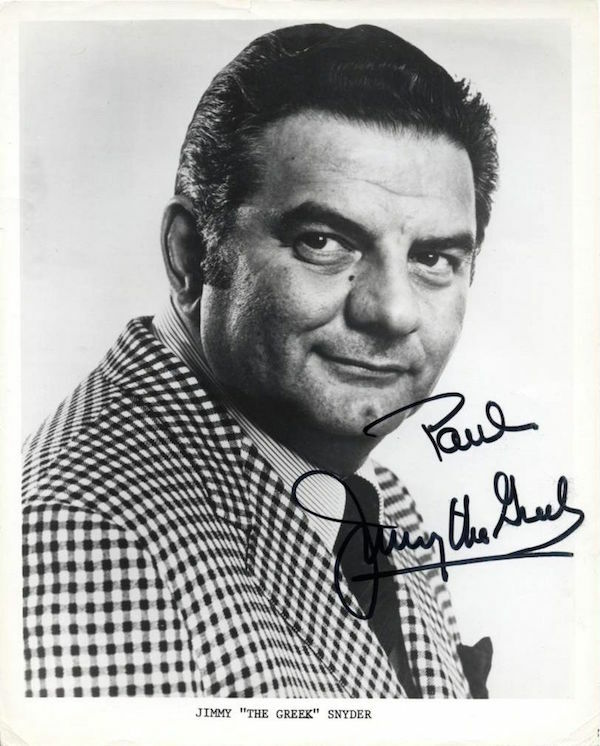 He was a career sports bettor, television prognosticator, and outsize personality that injected street smart grit and spilled cigar ash on the sterile CBS studio where most of us first encountered him. Jimmy brought sports betting out of the bar and into post-church middle class living rooms by way of his weekly picks on The NFL Today. Snyder was fired by CBS in 1988 for “racially insensitive comments” he made on camera at a banquet dinner. Whether Jimmy was actually a racist or just put his foot in his mouth on a topic he really didn’t have any business speaking on seems up for debate. Both his longtime NFL Today co-host Irv Cross (who is black) and Jessie Jackson defended Snyder and Jimmy famously spent the rest of his life apologizing for the incident, humbled and disgraced. The world largely turned its back on him, which is perhaps how he ended up nearly un-locatable in Steubenville. The Greek’s surroundings in the New Chapel are particularly sad considering the phenomenal beauty of the rest of the park. 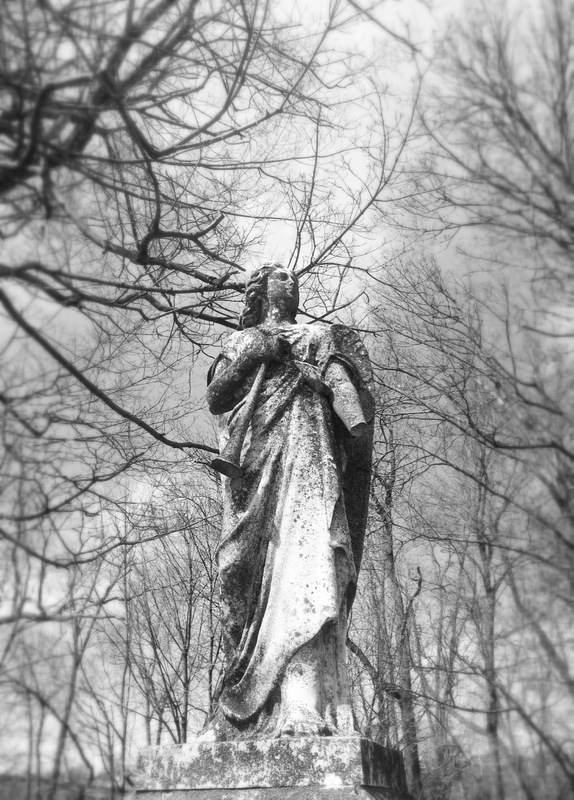 He’s going to spend eternity in a mausoleum that looks like a Denny’s while the rest of the of his neighbors are ensconced in the tree-filled, lush rolling hills of this gorgeous circa-1845 cemetery. 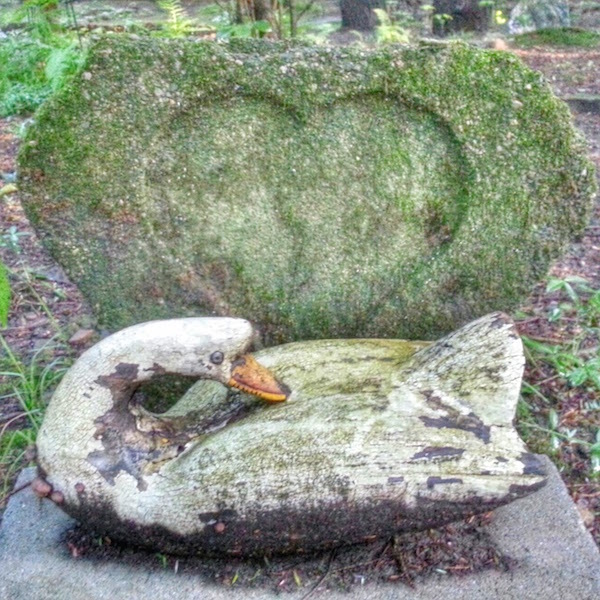 Union Cemetery has the characteristic design of others from this era: non-linear paths that work around the topography and ancient trees that grow between–and sometimes up and over–the graves. 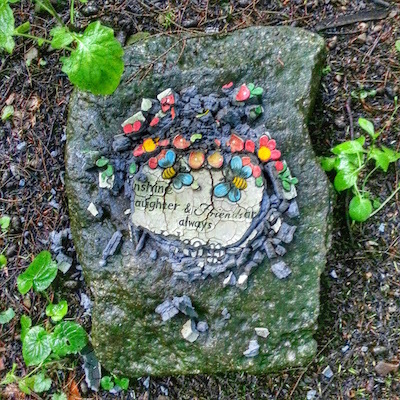 The markers are notably more humble than those in Pittsburgh’s Allegheny or Homewood cemeteries, and have suffered a greater natural decay (cheaper material? harsher climate? less maintenance?). But taken as a whole, it has a similar level of natural beauty, solace, history, and nature-without-man chaos. Union Cemetery takes extra pride in their veterans. 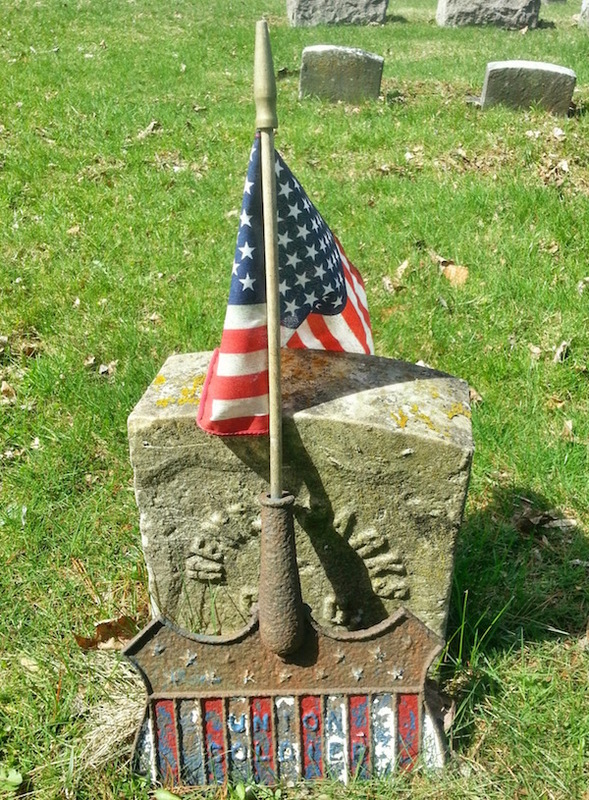 The (many) Civil War graves each have a special iron shield, many still painted red, white, and blue, marking them as “Union Soldier”. Veterans from Cuba, World Wars I and II, and Korea each got similar, if less ornate, treatment. Vietnam veterans have an entire section to themselves, sharing space with large mortar cannons. I don’t know that I can recommend a trip to Steubenville just to visit Jimmy The Greek, but we found some other interesting things while we were there (more about that in some future dispatch). However, if you’re in the area, and it’s as beautiful a day as we got, The Orbit has its own tip for you: do yourself a favor and stop by to say hello to The Greek.